braids, bouquets, samplers.... oh my. 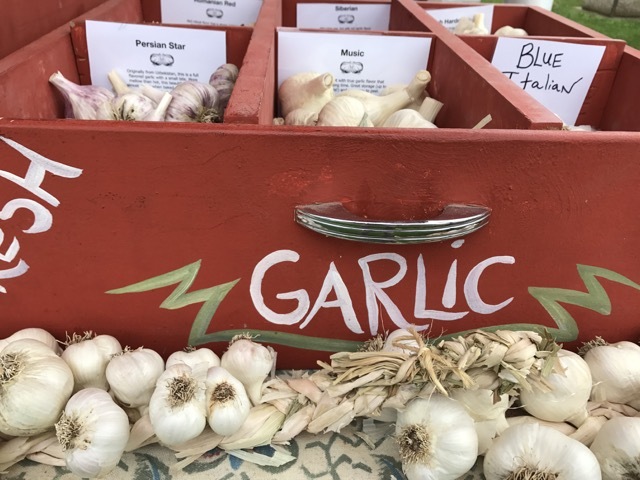 If there is one thing we love to grow, it's garlic. And if there is one thing we love to braid, well.... its garlic. Our braids are around 1.5 pounds of pure garlic bliss and sell out quickly. Harvested, then braided in July and early August, we hang dry and cure them for several weeks. They are typically ready to ship by September 1st. These are hardneck bundles, made spectacularly beautiful and perfect for bridal bouquets, holiday gifts, housewarming parties or simply to bring a little taste of summer into your winter kitchen. Flowers colors are left up to us, or you can tell us your preference and we will do our best to accommodate. Hit all five senses with five of our favorite different varieties (over 5 pounds of garlic!) and 5 times the fun. A great way to dip your toes into our world of garlic without being overwhelmed by choice.